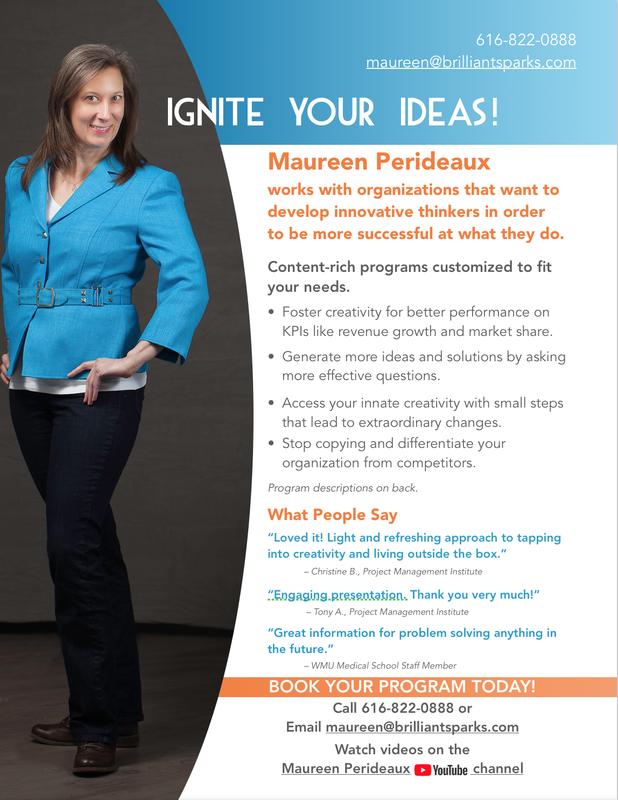 I help organizations develop innovative thinkers so they can be more successful at what they do. Watch this video to discover how creativity boosts KPIs. • Light Your Creative F.I.R.E. • Bust Outta the Box, Baby! • Ask Better Questions, Get Better Results. ​Or, ask me about an interactive workshop customized for your team. ​Call (616) 822-0888 or email for more information. Discover the four elements that lead to more ideas, better collaboration, and better outcomes—because waiting for inspiration is not an effective strategy! Provide constructive criticism in a way that fuels team enthusiasm. Bust Outta the Box, Baby! 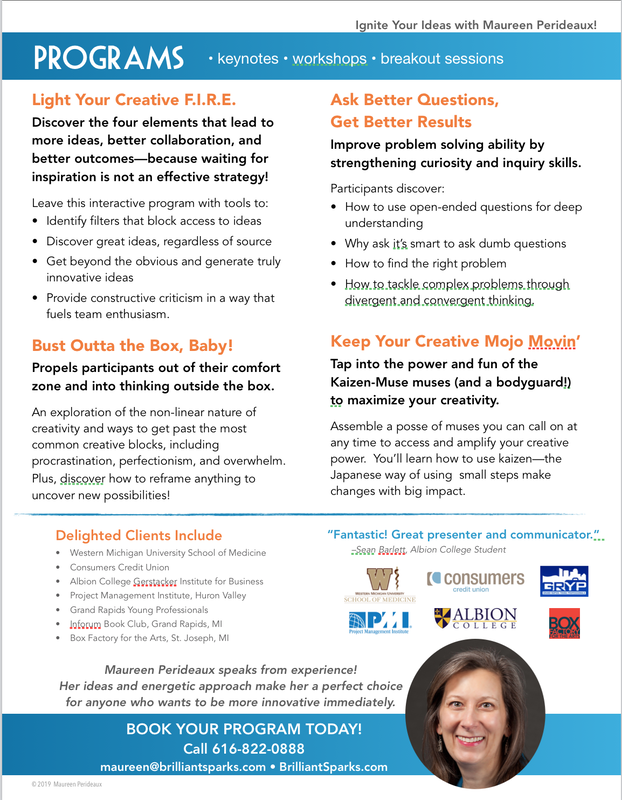 Video: Discover how Kaizen can enhance your creativity. Propels participants out of their comfort zone and into creatively thinking outside the box. Plus, how to reframe anything to uncover new possibilities! Improve problem solving ability by strengthening curiosity and inquiry skills. How to tackle complex problems through divergent and convergent thinking. Only watch this video if you want see if you're as smart as Einstein when it comes to solving problems. This video shares exactly what you need to do when perfectionism gets in the way of your creativity and innovation. ​Tap into the power and fun of the Kaizen-Muse muses (and a bodyguard!) to maximize your creativity. Assemble a posse of muses you can call on at any time to access and amplify your creative power. You’ll learn how to use kaizen—the Japanese way of using small steps make changes with big impact. Click image to open PDF.